Successfully Added Frosty LED Snowman Christmas Ornament to your Shopping Cart. Great! The happiest Christmas you'll ever have is coming. Did you get all your gifts yet? 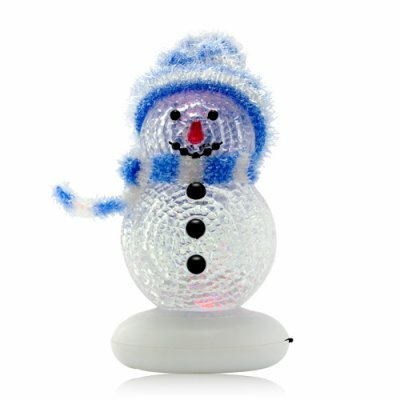 Give your friends and acquaintances this Frosty LED Snowman Christmas Ornament - a multi-color LED lovely little mini snowman. Simply turn Frosty on and it will explode with life and light up your entire room with different colors of vivid brightness: red, purple, blue and green. Place this little fellow on your night stand, on your desk at home or work, next to the cash register at your store, and you've got instant holiday ambiance and magical color in the making. This cool decorational item comes with a built-in battery so you won't go to the poor house buying batteries for it. Simply plug it into the USB charger for two hours and you're good to go for endless holiday cheer! Buy some for your home, work, or sell them on your online store. This is one unique Christmas ornament your customers will love - brought to you by the online leader in direct from China wholesale electronics - Chinavasion. This ornament doesn't need to be plugged in to work. It has a built-in battery to power the inner LED lights and provide hours of colorful cheer. When the LED lights start to dim, simply attach the USB connector and recharge for a few hours. Can I use this for Festivus? Festivus is a holiday for the rest of us which features the annual airing of grievances and feats of strength demonstration. As such, sure why not.